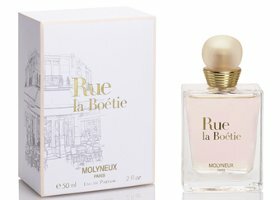 Molyneux Paris has launched Rue la Boétie, a new floral fragrance for women. The notes include bergamot, mandarin, iris, peony, jasmine, white woods, vetiver and musk. Molyneux Paris Rue la Boétie is available in 30, 50 and 100 ml Eau de Parfum. LOL. Just a couple of weeks ago I mentioned in reply to one of Angela’s article that names that were well known at one time, like Molyneux, were never heard of these days. I guess someone heard me and quickly came out with a new fragrance. … that… of someone bought a dead name and will start releasing insipid fragrances under that once great name. Much of their modern output is flankers to Quartz, men & women, but they don’t do all that many of those either, & otherwise they’re relatively quiet. A shinny universe? Sounds painful. Oh but wait, it’s a mythical place. Fine.